What is the Chorleywood Baking Process? 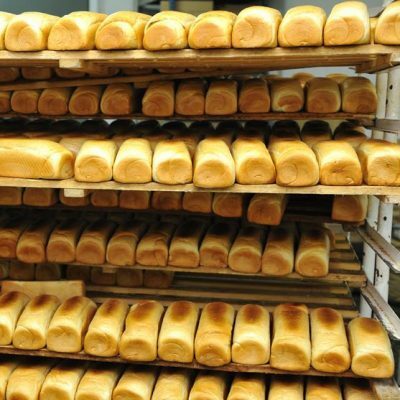 The Chorleywood Baking Process (CBP) is a no-time dough system combined with an enclosed high-speed mixer that is used in large-scale production of yeast-leavened bakery products such as white pan bread and buns. CBP is based on the well-known principle that mechanical and biochemical development of dough are somewhat interchangeable. Dough needs to have a proper balance of development from mechanical action and fermentation reactions. The longer the fermentation time, the shorter the dough should be mixed (e.g. in a sponge and dough process). Mixing and dough development in a single operation that lasts 2–5 min at a fixed energy input (KW/Kg) are carried out with a closed high-speed (i.e. high rpm) Tweedy mixer. A work input of 11–13 Wh/kg is typical; this is equal to 5–8 times the energy expended during mixing in a normal straight dough method. As the level of energy per load of dough in mixer increases, so does bread volume; with this comes a reduction in cell size and increased crumb grain uniformity due to improved subdivision of air cells. Addition of a dough conditioner mix known as improver or concentrate (at 0.3–1.0% based on flour weight), commonly containing oxidizing agents such ascorbic acid or potassium bromate (to improve gas retention of dough during proofing), a high melting point fat, emulsifiers (to provide dough strength and extend shelf-life) and enzymes (proteases and amylases to boost yeast activity and ease dough expansion during proof). This dough improver helps to shorten batch times and comply with the no-time dough concept. Addition of extra water to adjust dough consistency (attain good extensibility, reduced resistance to deformation and just enough elasticity) to be comparable with that from bulk fermentation. Another goal is to increase yeast activity by lowering osmotic pressure within the system. More water is needed when making a dough using the CBP because of better hydration and water binding effect of flour during intensive mixing. Addition of extra yeast (usually double that of the straight dough method) to maintain comparable final proof times, increase gas levels and give the same dough volume increase during final proof as the straight dough method. Control of mixer headspace atmosphere (higher or lower pressures) to achieve optimum crumb grain (cell structure). Function of ascorbic acid may change depending on the availability of oxygen in air. Intensive mixing causes dough temperature rise of 14–15°C (57–59°F), thus a cooling mechanism (e.g. water jacket around the mixing bowl or use of flaked ice) is needed to maintain dough temperature of 28–30°C to keep proper yeast activity and dough handling properties. It is advisable to delay fat or oil addition to avoid lubrication effect and provide as much friction as possible during first stages of mixing. Cauvain, S.P., and Young, L.S. The Chorleywood Bread Process, Woodhead Publishing Limited and CRC Press LLC, 2006. Cauvain, S.P. “Bread: Breadmaking Processes.” Encyclopedia of Food and Health, Volume 1, Academic Press, Elsevier Ltd., 2016, pp. 478–483. Sievert, D., Hoseney, R.C., and Delcour, J.A. “Bread and Other Baked Products.” Ullmann’s Food and Feed, Volume 2, Wiley-VCH Verlag GmbH & Co., 2017, pp. 462–482. Hsi-Mei, L., and Tze-Ching, L. “Bakery Products.” Handbook of Food Science, Technology, and Engineering, Volume 4, CRC Press, Taylor & Francis Group, LLC, 2006, pp. 148.1–148.47.